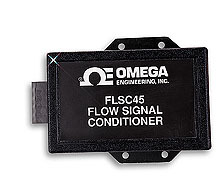 The FLSC-45 is a dc powered frequency-to-analog output signal conditioner with a 4 to 20 mA or 1 to 5 Vdc field selectable output. The high performance electronics will accept a low level magnetic pickup signal from a paddlewheel or turbine meter directly without amplification and convert it to an industry-standard analog output. Two models are available, the standard FLSC45, with a plastic enclosure for wall mounting, and the FLSC45B, which features a rugged die-cast aluminum housing with a NEMA 4 (IP65) rating.